When I’d originally signed up to Run Hackney again this year, I was hesitant because, not only was it two weeks after London marathon (same as last year), but it’d also be four weeks before the Transylvanian Bear Race, which would mean I’d be running 2.5 marathons in 6 weeks. This didn’t seem particularly wise for my recovery and ability to run another marathon (a mountainous trail marathon, no less) in quick succession, but then I got offered a place, realised that 150 of my Run dem Crew friends would be running it, plus I really enjoyed it the past two years… and, well, I could always just party pace it, right? Well, plans changed somewhat when I was so ill for the first three months of the year – I had to cheer the Cardiff World Half Championships instead of trying for a PB (measly goodie bag for £56, and it turned out the weather was comically awful), and I had to defer London marathon to next year, leaving my original plans for Run Hackney a bit up in the air. Should I try for a PB on only a few weeks training? Or just enjoy it and have fun with friends? Or use it as a long run and an excuse to test out some new tactics for Transylvania? Well, another cold (low level, thankfully!) plus a scorching weather forecast put paid to any hopes of a PB, plus my running hasn’t felt entirely up to my usual standards since I restarted in April. 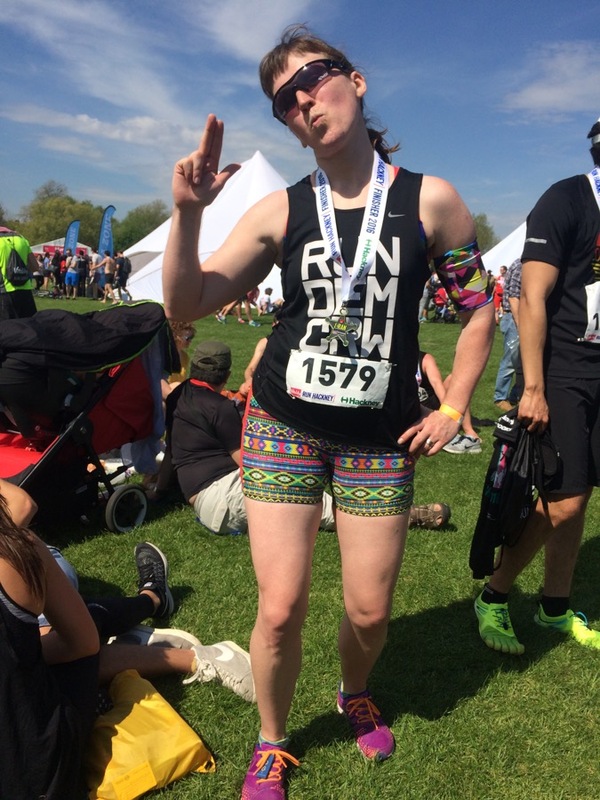 It’s clear I’ve lost fitness while I was ill, and even my former marathon pace is a bit of a struggle, so to be perfectly honest, I didn’t really even have a finishing time in mind. I mostly ended up using the race to help keep others’ spirits up, but also to refresh my race memory ahead of Transylvania, and test out my new homemade flax gels in a race setting, too. Let’s get the obvious out of the way from the start – it was a brutally hot day. Even worse was that we’d been still having freezing temperatures right up until the week before, so it felt even hotter. 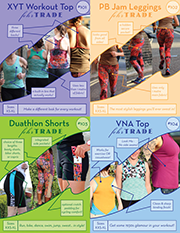 Last week I ran in a merino long sleeved top and thermo leggings – today it was a skimpy vest and my short shorts. It was so hot that the organisers laid on weather advisory flags throughout the course, and by the time I was leaving, they were actually advising anyone still running to walk instead for safety’s sake. I drank about three times as much water during the race than I normally would (plus 3 bottles of electrolyte, 2 bottles of water, and a recovery shake afterwards, and my pee still told me I was dehydrated! ), and the 5 or 6 misting showers on the course were downright compulsory. The people of Hackney also stepped up, with quite a few hoses and super soakers turned on the runners, in addition to the usual tubs of jelly babies. The crowd support is definitely getting better year on year for this race, too – I remember the first year seeing residents walking down the street looking at us runners like we had three heads like “what in the hell are they doing? ?”, then last year really getting in the spirit of it, and this year there seemed to be a big step up in the number of crowds. They weren’t the loudest of crowds, mind – in several spots I had to do the universal hand gestures for “Come on and cheer us! !”, but I did get a lot of individual shouts for me in my Run dem Crew vest. In terms of how my actual race went – I started out with a group of about 5 ladies from RDC, informally paced to 1:50 finish by my friend Vicky. The first few miles were pretty dense so there was a lot of stressful ducking & diving to keep with the group, and I always knew that the 8:20ish/mi pace was going to be unrealistic for me to maintain in my current state of fitness. So I’d always planned to fall off the group at some point and aimed to probably keep somebody else company who couldn’t maintain that pace in the heat, either. I ended up hanging on until halfway, but then I could feel myself really needing both nutrition and a bit of a cooldown as I could feel my face going hot and then goosebumped, which really wasn’t a good sign. So I opted to walk as I ate my flax gel (like a banana porridge goo – totally delicious, and I’ll share the recipe later this week!) from my baby food pouch and then when I started running again after eating I settled into a more comfortable pace. Just slowing my pace by a few seconds and taking on nutrition made such a difference – I ended up having the best 3-4 miles of my entire race after the halfway point, really enjoying the atmosphere and feeling alive. It was also around this point, I believe, that I chatted with a guy, Julien, who I’d spotted in the start pens wearing an Anthony Nolan vest, and told him they saved my life 7 years ago. It turns out his mum is having a transplant this week, so I offered him/her all sorts of advice, and even ended up finishing within seconds of him. I like to think that even just seeing a lady like me run a half marathon will give he and his family hope that she can get through this and gain a full and healthy life afterwards. 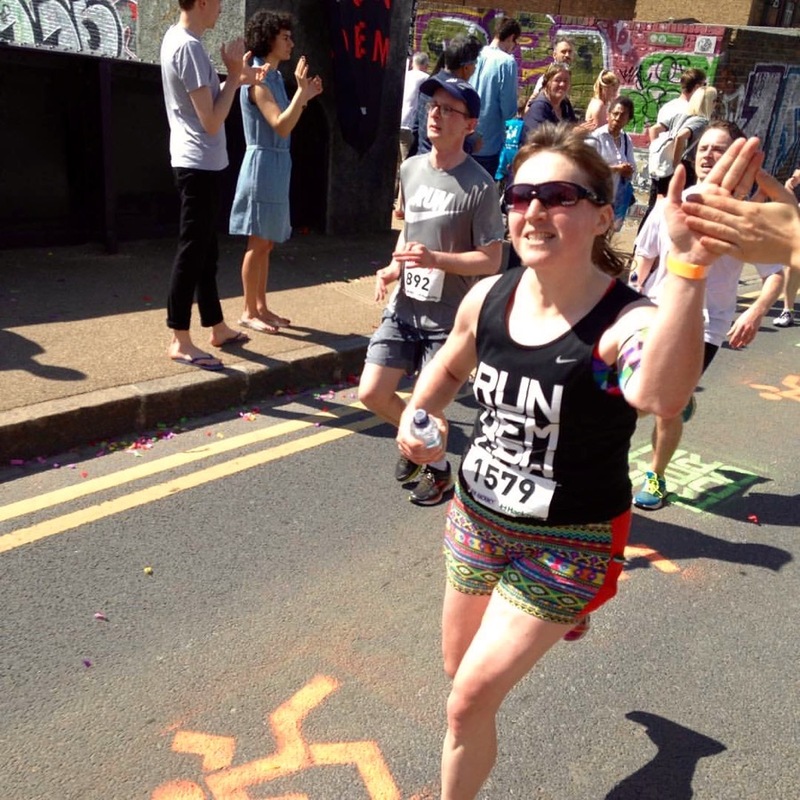 But back to the race – I felt my gel starting to wear off around Mile 10 or so, and I wished I’d either packed another or thrown in some shot bloks from my backpack, so it was absolutely perfect timing that Run dem Crew’s cheer point appeared in front of me! 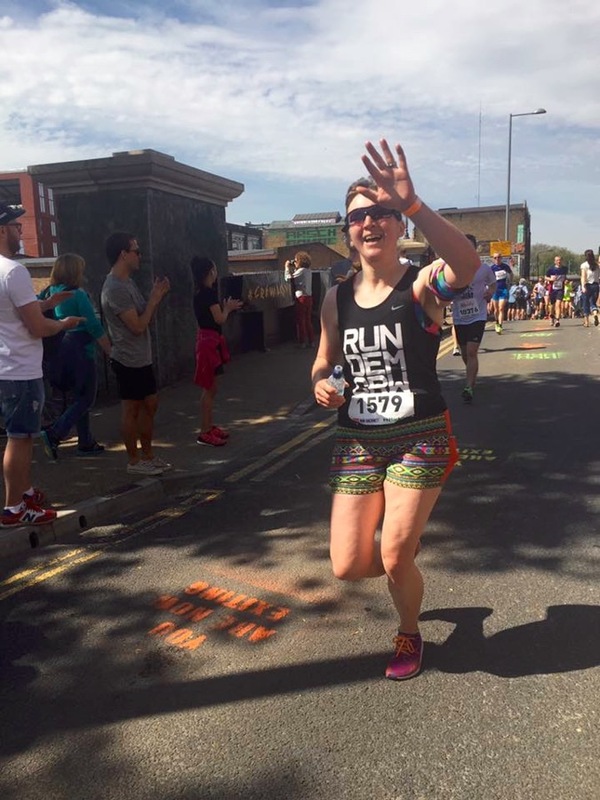 I’ve witnessed the power of “Cheer dem” at Mile 21 of London Marathon, and this was like its little sister – just as powerful, but in a shorter stretch of road. Honestly, this was such a needed boost – lots of cheers, high fives, and shouts of encouragement were just what I needed! I knew from running the course previously that the last few miles through the Olympic Park were the hardest of the whole race due to the lack of shade and crowd support, and the cheers from my friends were what powered me through. I say “powered”, but really those last few miles were just a slog to the finish! It was a tradeoff between pushing myself to “just get it done”, and holding back to keep from getting heatstroke. Heatstroke was a very real possibility – I saw another runner collapse just in front of me at Mile 11 and, after myself and another runner helped him onto his feet, he couldn’t stand up on his own and we helped him to the curb where a group of spectators took over. While the casualties were in no way as bad as the 2014 race, St Johns Ambulance were certainly kept on their toes today and I wanted to avoid becoming a statistic. But eventually I saw Hackney Marshes and the finishing straight, and I even managed to pick up the pace a bit when I saw the gun time clock read “1:58:something”. Even though I knew I could subtract 6 minutes from that, there’s nothing more like a red rag to a bull for a runner than to see a clock so close to an hour like that! Then it was a matter of collecting my goodies (Hackney always lays on a decent goodie bag – this year it was cola bottles, beetroot shot, popcorn, yoghurt raisins, oystercard holder, bananas, flapjacks, water, and nice tech tee), and then collecting my bag from the bag check, where I had my own goodies in store. You see, I got the grand idea that since everyone tends to laze around in the sun afterwards, it’d be awfully nice to have some chilled fizz to celebrate. So I took a bottle of sparkling rosé from the fridge, inserted it in one of of those bottle-wrap frozen gel things, placed a frozen bottle of electrolyte next to it (another stroke of genius, I might add!) and wrapped them up in a chill bag and put it in my backpack. 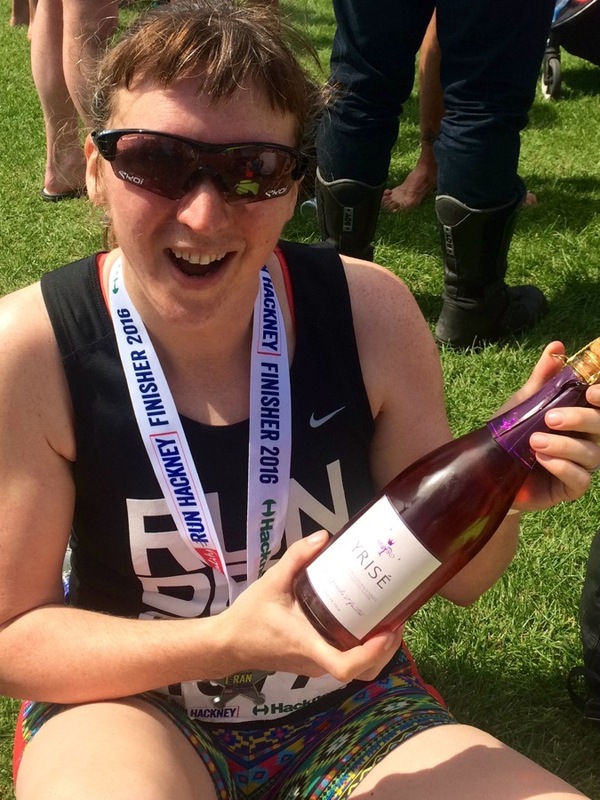 So after the race, after I’d had my recovery shake, done some stretching, and downed a few bottles of electrolyte, I opened up a cold bottle of fizz and shared it round! And yes, I’m pretty proud of Previous Me for both thinking of it and remembering to pack it all at 6am! It really helped to add to the celebration atmosphere in the race village afterwards, with the bhangra bands, group photos, hugs, and congratulations. 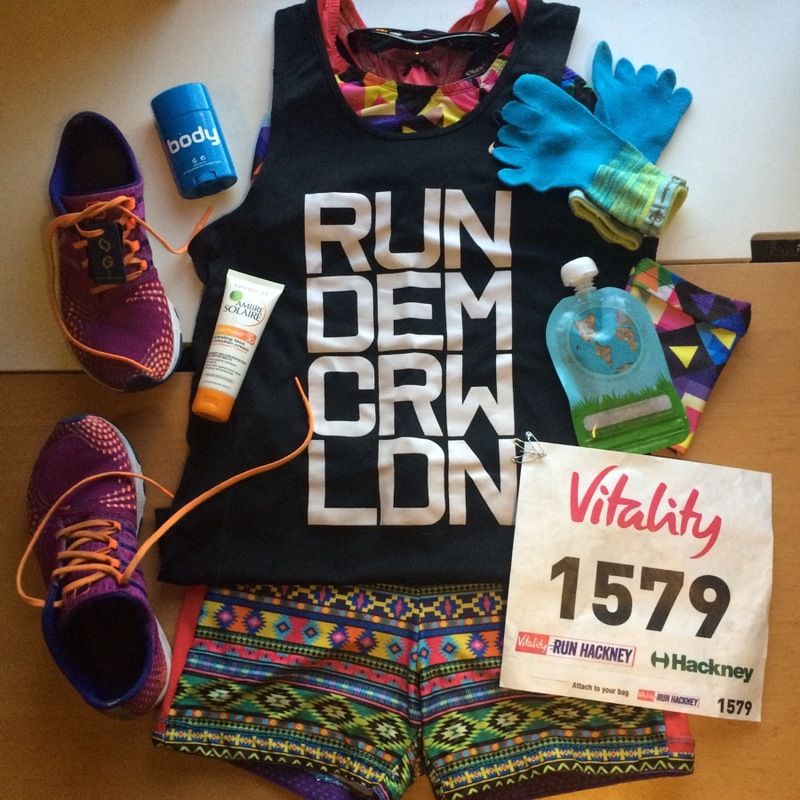 The founder of Run dem Crew, Charlie Dark, often says that race day is a celebration of all the hard work you’ve put into training, but as I ran around the streets of Hackney today, I realised more that for me, today’s race was a celebration of health and happiness. I didn’t get the opportunity to really train for this race, but instead I was just thankful to be healthy enough to run it at all. Lovely recap and so glad you are finally healthy enough to do it. Your story about Julian’s mom was really touching. This is what your recovery is about — inspiring others, and you are so good at it. Love you, Girl! Now, off to Transylvania! May the weather be improved! Great report. 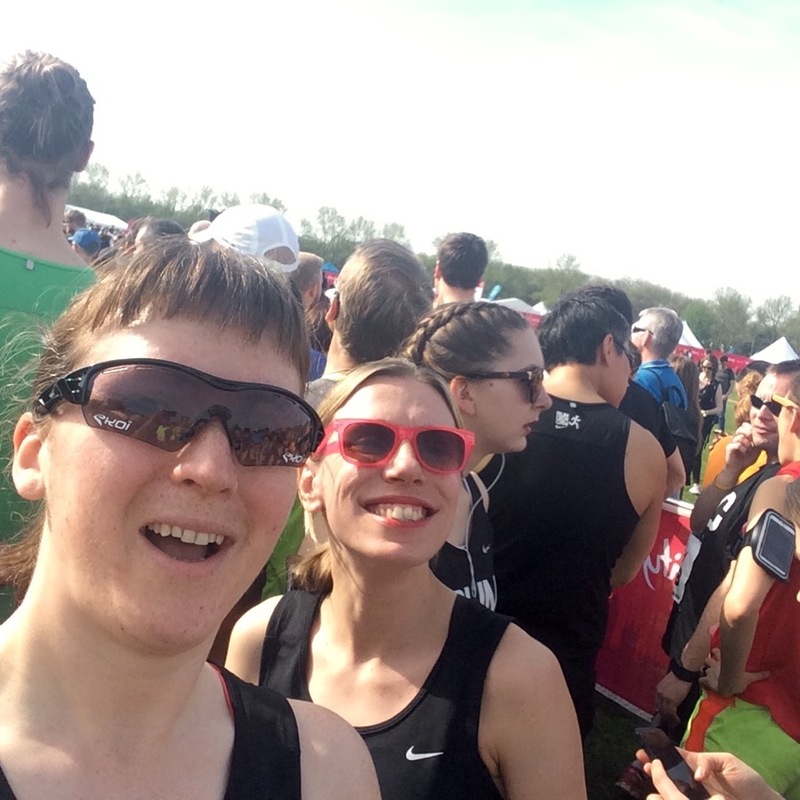 I did my first 10k on Sunday (my 57th birthday no less!) And the heat was brutal. I struggled but finished a little faster than I expected, though still slow to someone like you. The start wasn’t until 11.30 and I really didn’t know what to eat for breakfast so ended up hungry half way. I could have used a flax shot then! I look forward to the recipe. You must have been a real shot in the arm for the lady waiting for her transplant. You are a magnificent ambassador for Anthony Nolan. You should be exceedingly proud of your achievements. Well done Melissa.